(1) Alert. The alert is the first element of the initial fire command. Its purpose is to choose the gun crews and ready them to receive and execute the fire command. FIRE MISSION is announced for all targets. When two or more guns are to fire, the leader announces, FIRE MISSION. If only one gun is to fire, then NUMBER 1 (2) FIRE MISSION is given. When the leader wants to alert all guns, but only wants one gun to fire, the announcement is FIRE MISSION, NUMBER 1 (2). (a) Oral. When the target is not obvious, the leader must tell the gunners where to look. The leader gives direction as: FRONT, RIGHT FRONT, LEFT FLANK, and so on. The leader may identify an indistinct target by the use of a reference point. The selected reference point, announced as REFERENCE, must be a distinctive terrain feature or object in or near the target area. The word TARGET precedes the target description when a reference point is used. REFERENCE: BUNKER, FIVE ZERO ZERO. TARGET: TROOPS EXTENDING RIGHT TWO FIVE, LEFT TWO FIVE. TARGET: MACHINE GUN IN EDGE OF WOODS; FIVE ZERO ZERO. CENTER OF HEDGE, GATE, ABOVE GATE. • For a tripod-mounted MK 19, the interval between the reference and the target is measured by laying the gun on the reference point and manipulating the gun a given number of mils to the target. (b) Firing a MK 19. Pointing out an obscure target by firing a MK 19 is simple, fast, and accurate. However, it may cause loss of surprise or premature disclosure of the gun's position. The leader announces the general direction of fire, if it is not obvious. He then lays one gun on the target, commands: WATCH MY BURSTS, and fires one or more on the target. The leader completes the designation orally using the target's midpoint or extremes: RIGHT FLANK, MIDPOINT, or NEAR END. Firing rifle tracers at the target also makes it easier for the gunners to find. (c) Laying a MK 19. Laying the gun on a target is a simple and accurate method that does not sacrifice surprise. The leader goes to each gun, lays it on the target, and has the gunners check the lay. The gunners open fire at the same time on command. (3) Range. This element follows the target description. The leader announces it in even digits, hundreds or thousands. For example: FOUR FIVE ZERO; THREE HUNDRED; ONE ONE HUNDRED; ONE THOUSAND. (4) Description. The leader gives a brief target description to inform the gunners of the nature of the target. Examples of target descriptions include TROOPS, which refers to any dismounted enemy personnel; MACHINE GUN, which refers to any automatic gun; and TANK, which refers to any armored vehicle. If several targets are in view, the leader may describe the target or part of a target to be engaged as LEADING TRUCK, RIGHT BUILDING, FAR END, HALTED COLUMN, and so on. If the target is obvious, no description is necessary. (5) Assignment Method. This element is used only when specific assignments are required to divide or subdivide the target, assign class of fire, or announce a rate of fire. NUMBER 1 RIGHT HALF, NUMBER 2 LEFT HALF. NUMBER 1 RIGHT TWO-THIRDS, NUMBER 2 LEFT TWO-THIRDS. NUMBER 1 RIGHT TWO-THIRDS, NUMBER 2 LEFT ONE-THIRD. • Sustained. The sustained rate of fire is measured in rounds for each minute and is the rate at which a MK 19 may be fired indefinitely without damage from overheating (40 rounds per minute). The leader announces SUSTAINED. • Rapid. 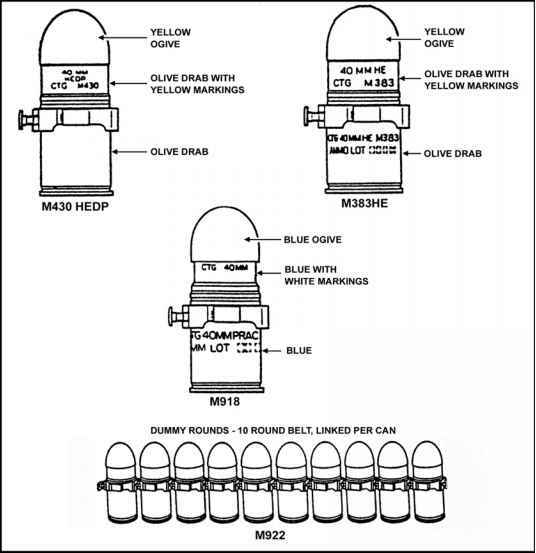 The rapid rate is measured in rounds for each minute and is the rate at which a MK 19 may be fired for a limited time without danger of overheating (60 rounds per minute). This rate permits a high volume of fire to be delivered for a short, set time. Gunners use the rapid rate unless another rate is announced. • Cyclic. The cyclic rate is the rate at which a MK 19 can be fired for a limited time only, at the fastest rate the gun will fire (325 to 375 rounds per minute). This rate may be used when the target or area needs the greatest possible suppression. The leader announces CYCLIC. (6) Control. The leader uses this element to give the command to open fire. For immediate engagement of the target, the leader gives the command, FIRE, or the arm-and-hand signal to fire without pause. Fire is often withheld for surprise and effect, and both guns open fire at the same time. To ensure this, the leader may preface the command or signal to fire with the words AT MY COMMAND or ON MY SIGNAL. When the gunners are ready to engage the target, they report UP or announce: NUMBER 1 (2) UP, READY, and the leader gives the command or signal to fire. b. Subsequent Fire Commands. The leader uses these to repeat or correct a fire command, to adjust fire, to cease or commence fire, or to terminate the alert. The deflection correction must always be given first. (1) Repeat Fire Commands. If the gunner fails to understand any element of the fire command, a repetition of the element may be requested by announcing the misunderstood element with rising inflection to denote a question. When repeating any portion of the fire command, the leader will preface it with the words THE COMMAND WAS. (2) Correct Fire Commands. The leader changes or corrects a portion of the fire command by announcing CORRECTION and giving a command. For example, to change an incorrect range command of 500 meters to 600 meters, the command is CORRECTION, SIX HUNDRED. (3) Adjust Fire. The leader adjusts fire if the initial burst was not on target. The leader does this by announcing the direction and elevation needed to get on target ADD 100, RIGHT 20; or DROP 200, LEFT 50. (4) Cease and Commence Fire. CEASE FIRE is announced if the leader wishes to interrupt for any reason. This type of subsequent fire command informs the MK 19 crew that it will remain on the alert and that more instructions will follow. Firing is renewed by announcing a subsequent fire command or by announcing a new fire command. Firing is resumed with the same data by using the command FIRE. (5) Terminate the Alert. To allow the MK 19 crew to relax between fire missions, termination of the alert is announced as CEASE FIRING, END OF MISSION.